I’m not saying all economists can’t answer these questions. I’m saying that collectively these are core parts of what the discipline of economics should be about and yet are topics dealt with by fringe groups whose key insights have not penetrated the textbooks or been shared widely across the discipline. 1. What is money and where does it come from? There is only one textbook that gets this right. Despite the economics discipline being told directly by the world’s second oldest central bank that their textbooks are wrong nothing has changed. Students continue to learn the debunked money multiplier model. It is puzzling how an intellectual discipline that doesn't understand money invented, advocated for, and implemented, monetary policy—a tool that most nations almost exclusively rely upon to improve economic stability and growth. 2. What do prices do? Prices best perform the function of clearing markets in those markets that are not in core economic theories—financial markets. But this is clearly not the main function of prices in markets for real goods and services. Many firms choose to have shortages, queues, or wastage, rather than change prices. I think Fieke van der Lecq got it right—prices are just one of many rules that help form a coordinating system and stable prices facilitate long-term coordination. Imagine if your local supermarket adopted surge pricing and increased prices when there were checkout queues? That would disrupt coordination and mean some people will leave their goods on the shelf potentially coming back later or going to a supermarket where the prices are predictable. The predictability of price helps all actors in the economy plan ahead. If prices are really the super-flexible rationing tool economic theory assumes you would expect them to be changing frequently. 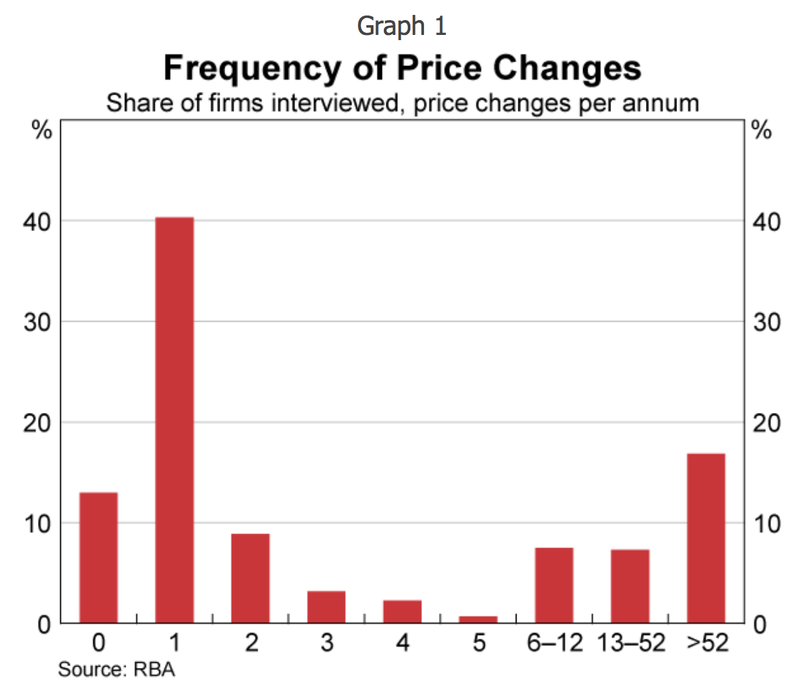 Instead, most firms change prices once a year or less. 3. What are opportunity costs? The most insightful idea in economics is that resources are scarce and there is an opportunity cost for using labour time, land, labour and capital equipment for one purpose over another. This is the core idea of economics, and yet when you survey a bunch of professional economists at their annual conference they can’t answer their own textbook questions on it. Then they take to the journals to say that ‘opportunity cost is whatever I want it to be!’ Crazy. Confusion over opportunity cost is pervasive even in core models. For example, cost curves (in the theory of the firm) are opportunity cost curves but we drop the logic of opportunity cost in the model and compare profits at different output levels without considering the different opportunity costs arising from the different amount of resources needed at each output level. More on that conundrum here. Out of interest, the question that stumped trained economists is this. You won a free ticket to see an Eric Clapton concert (which has no resale value). Bob Dylan is performing on the same night and is your next‐best alternative activity. Tickets to see Dylan cost $40. On any given day, you would be willing to pay up to $50 to see Dylan. There are no other costs of seeing either performer. What is the opportunity cost of seeing Eric Clapton? A. 0, B. 10, C. 40, D. 50. 4. Why do firms exist? It may surprise some readers but the core economic theories that show how markets create a socially optimal outcome rely on the existence of a central planner to do it (Walrasian auctioneer or some equivalent). The organising mechanism is assumed away rather than being the focus of analysis. This approach is typical. The layers of organisation and non-price rule systems that exist in a society that coordinate production between and within firms are mostly neglected or assumed away. Firms themselves also come in many types. Of course, there is a literature on this (like everything) but it is not ‘standard’ economics and most students will never hear much discussion about it in their classes beyond some simple transaction costs escape clause. 5. How can poor countries become rich? You would think this would be a key insight of economists, but no, it remains a puzzle. For example, economists are divided on how to manage international trade to local advantage—specialise or protect industries to promote more diverse productive capabilities—and have little to say about workable ways for the public sector to productively set rules and administer them to guide development that brings widespread prosperity. Economists have pointed the finger at a lack of competition as the cause of many of our social ills. And yet competition is clearly inefficient in markets where economies of scale exist and under a host of other well-known conditions. We also know that for a fixed number of firms in a market for an identical product that naive price experimentation will lead to the monopoly outcome across the whole market (see here and here). Any economic value from competition must be a story more like that of monopolistic competition, and must be more about expanding the ‘product-space’ rather than under-bidding on price in well-defined markets with known competitors. Many economists proclaim that more competition will help in just about every circumstance without really teasing out the details of how exactly that would happen. Because if you know the details of what investment would be made and what products and prices would be desirable under competition then the logical question is whether these outcomes can be achieved more efficiently in other ways. Competition is often just a convenient excuse to do nothing rather than make tough decisions as a community, and economists go along with it. "Banks are ripping us off, what can you do?" "Housing is too expensive, what can you do?" "Schools aren't well resourced, what can you do?" "The public transit system is failing, what can you do?" In practice, the word has lost all meaning. It is a feel-good religious mantra. Indeed, I would argue the ‘peril of monopoly' is more a failure of politicians and law-makers to operate in the interests of the broader public. Often the prevalence of monopolies and cartels correlates with high rates of economic growth. Here’s an interesting take from Richard Werner. Considering therefore the half-century from 1950 to 2000, we would expect the best performance in those economies that are more market-oriented, and the worst performance in economies that have chosen to practice intervention, ‘guidance’ and the use of production cartels. 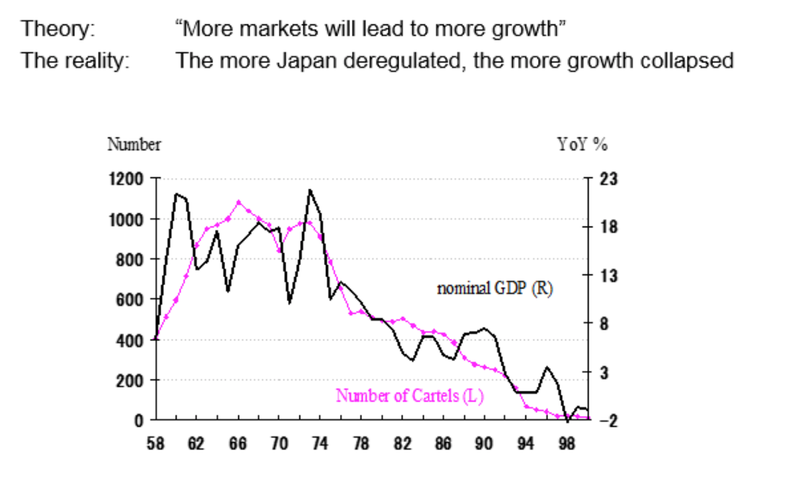 By the late 1960s, Japan was effectively not a market economy, but a ‘guided economy’ in which over 1000 cartels (official exemptions to the anti-monopoly law) had been established, in which tens of thousands of economic regulations allowed the bureaucrats to intervene in the economy, in which the stock and bond markets were largely irrelevant (as most funding came from banks), and in which the labour market was famously full of ‘rigidities’ and ‘inflexibilities’, with life-time employment, seniority pay and company unions. Lastly, a big one. Capital is either machines, or it is property rights. If it is machines and equipment it seems strange that these machines need to earn a rate of return for themselves. If capital is property rights then we have just exploded all economic theories that rely on the 'cost of capital’ since we can make this cost whatever we want through the legal system governing these property rights which can change their value, and hence the cost of capital. This is a massive unresolved debate that economists no longer seem to have an interest in, and yet incorrect conceptions of capital still underpin theoretical reasoning in just about every aspect of economics. fn. The new CORE Econ textbook is the only one I am aware of that gets it right. I picked up 10 random economics textbooks off the library shelf recently all of them present the money multiplier story. ** Some people on Twitter seem to take issue with What Do Prices Do and Why Do Firms Exist as being well-established questions dealt with satisfactorily so that your average trained economist would have a decent insight. After all, sticky pricing is an old problem and there are many theories about firm behaviour, agency problems, team production etc. To be more clear, economists think that the thing prices do (which was my question) is clear markets. Sticky prices come from a growing ad hoc list of restrictions on this primary function. Alan Blinder also had concerns about this approach, many of which apply to questions about firm existence. It is not that economists have ignored these questions. One could literally fill many volumes with good empirical studies of wage and price stickiness, and many more with clever theories purporting to explain these phenomena. Yet, despite all this work, the range of admissible theories is wider than ever, and new theories continue to crop up faster than old ones are rejected. (The study I am about to describe, for example, tests 12 theories; and my list is not exhaustive.) This lack of scientific progress makes one wonder about the basic research strategy that economists have been pursuing. I've added a line before the footnote so stands out.